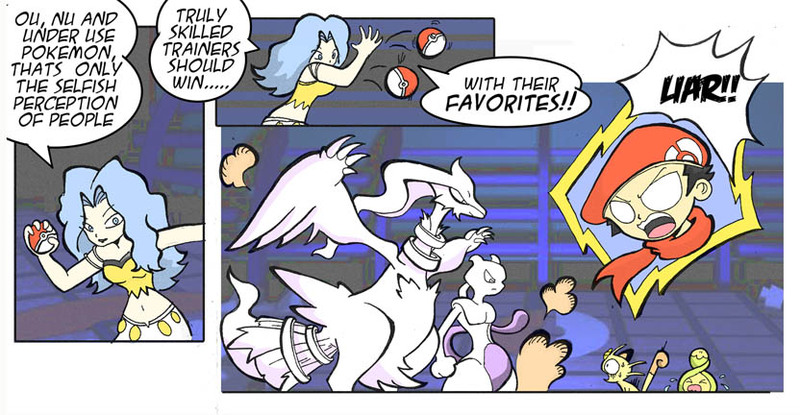 Filler comic today guest starring the elite four trainer Karen! ou(over use ), nu(never use) and uu(under use) are pokemon tiers for competitive play, I usually play with my favorites and I love to beat noobs using legendaries with my low tier pokemon (I love you cacturne) and mad because my Milotic is now a uu pokemon. This entry was posted on Friday, September 10th, 2010 at 12:39 am and is filed under Uncategorized. You can follow any responses to this entry through the RSS 2.0 feed. You can leave a response, or trackback from your own site. I am tired of those kids that only know to play with legendaries, but they use bad trained legendaries, so that is because is not so difficult to defeat them. How can I ref teen pop culture in this strip? What can I make fun of? Who is that bird/dog pokemon?? Unfortunately what with stats.. some are just.. better than others.. XD it’s impossible to have a fair fight.. but then it’s impossible to have a fair fight in real life too .